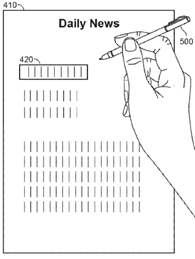 US patent application 20190087656 titled “Handheld Device for Capturing Text from both a Document Printed on Paper and a Document Displayed on a Dynamic Display Device” discloses capturing handwritten/digital text using a visual sensor in a portable scanner and displaying the captured text using a visual information subsystem. 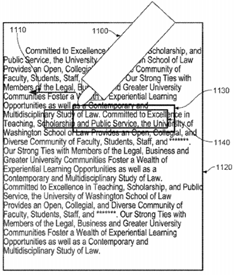 Figures below illustrate a user scanning text from a newspaper and document using the portable scanner. 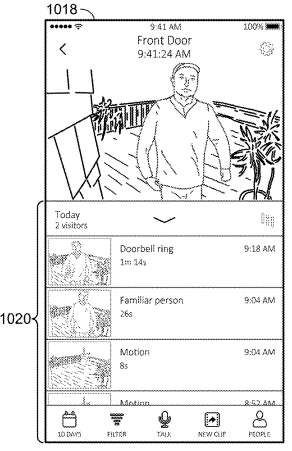 US patent application 20190089934 titled “Systems and Methods of Presenting Appropriate Actions for Responding to a Visitor to a Smart Home Environment” discloses a smart home environment that obtains contextual information regarding a visitor and interacts with the visitor via an electronic greeting system. The application also discusses user interfaces for notifying a user of a client device about the visitor, as illustrated below. 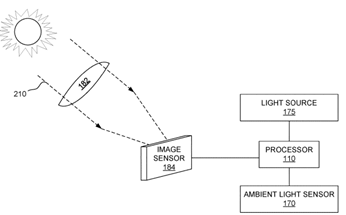 US patent application 20190086769 titled “System and Method for Improved Camera Flash” describes illuminating a scene using a pre-flash after adjusting light sensitivity of an image sensor based on autofocus output and ambient light measurement of the scene. Figure below illustrates a simple block diagram of the scene and various components of device. 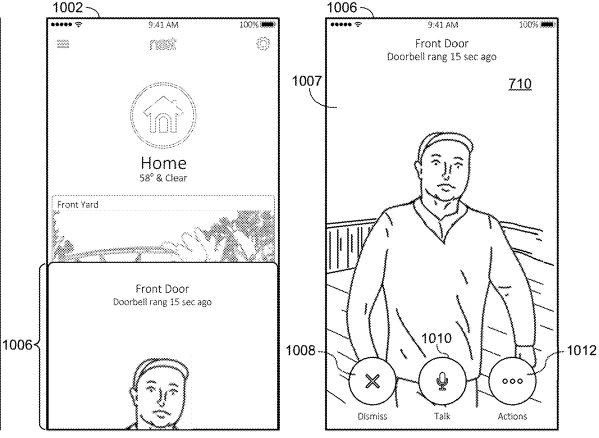 US patent application 20190086875 titled “Indicators for Wearable Electronic Devices” reveals status indicators with variably and/or progressively illuminable portions on wearable bands. 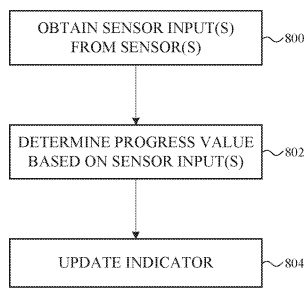 The indicators convey an analog representation of the completion progress of an activity tracked by the wearable device. Figures below illustrate the partial illumination of indicators and their operation. 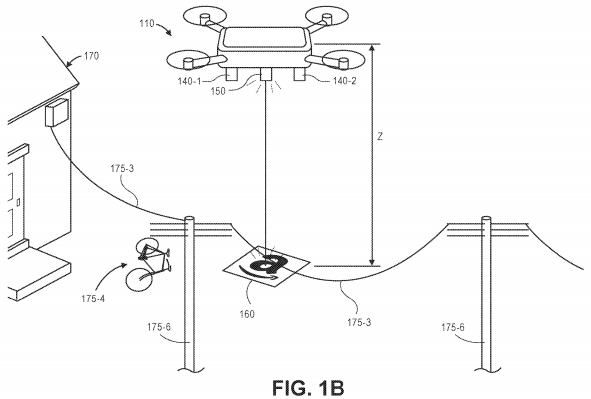 Amazon’s US patent application 20190087635 titled “Object Detection and Avoidance for Aerial Vehicles” discloses aerial vehicles equipped with imaging devices to detect small-sized obstacles or obstacles that feature colors or textures consistent with that of landing area, using captured pairs of images. Figure below illustrates an aerial vehicle performing safe landing operation. 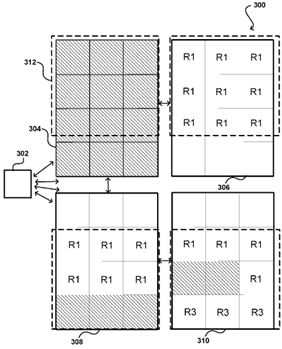 Another US patent application 20190087508 titled “Virtualized Rendering” published today discloses referencing content rendered on a first client to be displayed on other client devices so that similar content need not be re-rendered. This eliminates duplication of work across thousands of clients and reduces significant expense to the content provider. Figure below illustrates different rendering components providing content for different tiles of a set of pages. 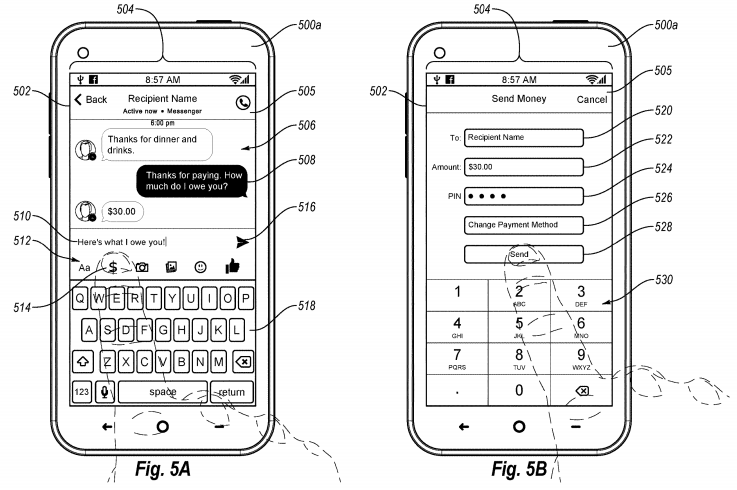 The US patent application 20190087811 titled “Sending and Receiving Payments Using a Message System” introduces a transactional payment system that enables users of a messaging system to send and receive electronic payments to and from other users of the messaging system, while providing status updates during the payment process. Figure below shows a messaging graphical interface. 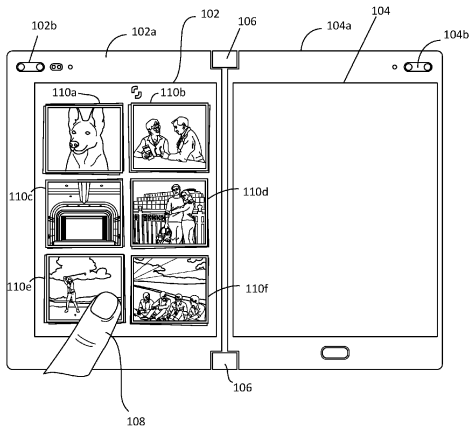 US patent application 20190087202 titled “Waking and Sleeping a Display among a Plurality of Displays Using Gestures” discloses identifying gestures made on a first display and cause a second display to sleep or wake based on the identified gesture and a current state of the second display. An example device having two displays with one display awake and the other display asleep is illustrated below. 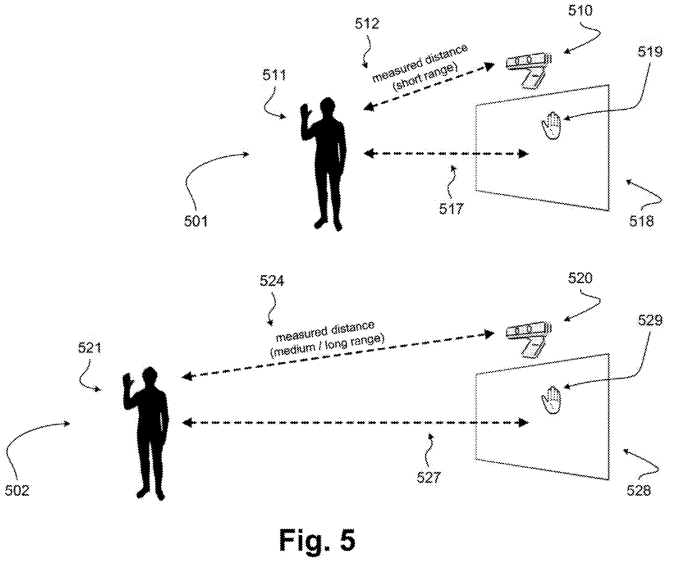 US patent application 20190089939 titled “Depth Sensor Optimization Based on Detected Distance” describes a mechanism for selecting best camera configuration based on detected distances between a 3D camera sensor and a person or object in view of the 3D camera. Image below illustrates a usage scenario of the mechanism. 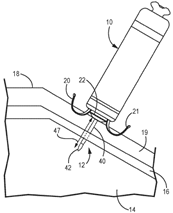 US application 20190083258 describes a lubricated tubular graft, designed to be implanted in the inferior vena cava (IVC) and the superior vena cava (SVC), to control blood inflow to the right atrium. Figure below is a schematic view of the tubular graft implanted in the SVC, IVC, and across the tricuspid valve. Minitablet compositions such as the one disclosed in 20190083406, and combination therapies as claimed in 20190083500 are part of Novartis’ growing attempts to fight against cardiac disorders and cancers. US patent application 20190083712 describes the model of a pump drive configured to regulate a dosing unit to control operation and dosage. Figure below is a schematic representation of the elements of the invention in a blocking and enabling configuration. 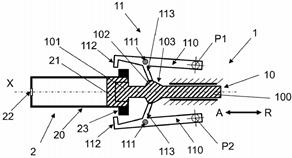 US patent application 20190083265 titled “Venous Valve Prostheses” discloses a valve for treating venous valve insufficiency. The valve has a closed configuration and an open configuration. Figure below illustrates the valve deployed inside a vein. 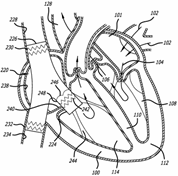 US patent application 20190083800 is related to electrodes for an intra-cardiac pacemaker. The disclosed pacemaker includes multiple electrodes attached to an insulative portion of the pacemaker. The device includes a tissue piercing electrode and a non-tissue piercing electrode. The electrodes help sensing electrical signals from the tissue and also deliver pulses to the tissue. Figure below illustrates an intra-cardiac pacemaker positioned at a target implant site. US patent application 20190083082 by Boston Scientific describes an introducer for use in percutaneous medical procedures. The application details the design, material, thickness, dimensions and manufacture of the introducer, and proposes alternative uses for the device. Figure below depicts describes the introducer. US application 20190083176 reports on a laser driven cauterization device that has an elongate body and a distal end. The distal end has a port that directs laser energy through an optical fiber. Figure below represents the cauterization system. 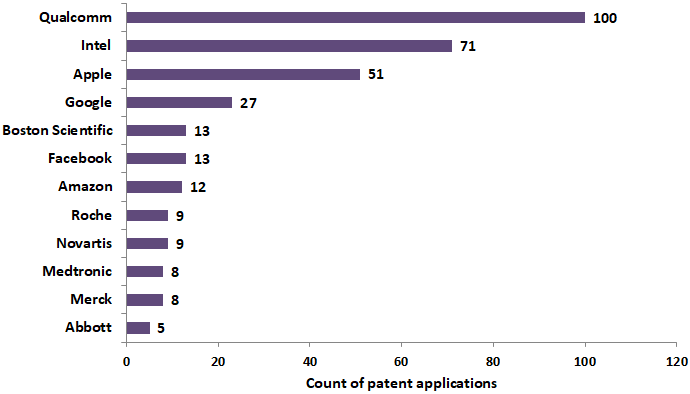 US patent application 20190083615 claims sequences of humanized antibodies and antibody fragments targeting LAG3 receptors.